Police in West Lothian are trying to find out what happened to a man who was found seriously injured. 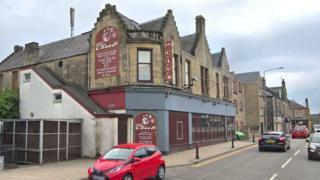 The 35-year-old was discovered in a property in the West Main Street area of Broxburn with unexplained head injuries at about 16:40 on Sunday. He was taken to Edinburgh Royal Infirmary where his condition is described as "critical". Police believe he had attended The Club venue on Greendykes Road before leaving at about 03:15 and walking west. They are now trying to establish how the man may have sustained the injuries and ascertain if any criminality was involved. The victim is described as white, around 5ft 7ins tall, of large build, and was wearing a black jacket, black trousers and black boots. Det Con Lynn Myles from Livingston CID said: "We believe that the man was in the area around the premises on Greendykes Road for a number of hours on Saturday night into Sunday morning and would be eager to hear from anyone who saw him after he left around 03:15. "We're also keen to hear from anyone who may have seen any suspicious behaviour in the West Main Street area in the early hours of Sunday morning, or the man around this time. "Anyone who may have private CCTV from residential or business premises covering the area is also asked to contact officers to assist the investigation."